SUNY Buffalo State teacher candidates traveled to Lusaka, Zambia, this summer to work at an international professional development school site. Through observation and cultural experiences, the teacher candidates were able to see how the Zambian school system works. This year, 12 undergraduate and three graduate students traveled under the leadership of elementary education and reading faculty Hibajene Shandomo, associate professor, and Sherri Weber, lecturer. “Providing our students with an opportunity to meaningfully experience other cultures is a fundamental cornerstone of the college’s mission and is integral to creating a strong educational foundation for academic growth,” Shandomo said. The Elementary Education and Reading Department offers students a variety of hands-on classroom experiences. The professional development school (PDS) in Zambia, one of many such options, has been supported by the Research Foundation. Faculty and students brought three donated laptops to Buffalo State's partner school in Lusaka; introduced pen-pal projects in the elementary classrooms; and practiced teaching math, science, and social studies. The teacher candidates had opportunities to observe and practice Zambian methods as part of the learning experience. The graduate students were also able to collect data for research projects at five Zambian schools through a partnership with the University of Zambia. In addition to interacting with the Zambian students who were eager to learn, the teacher candidates also explored the country, visiting an orphanage and learning from cultural engagement, socialization, and conversation at a traditional market. Shandomo plans to take a group of teacher candidates to Zambia every year. Read students blogs from the Zambia program: Heather, Jacquie, and Katie. 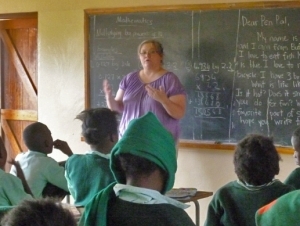 This experience in an international PDS site was made possible in part by the International and Exchange Programs, the Research Foundation, the Equity and Campus Diversity Office, the Graduate School, the School of the Professions, the School of Education, and the Elementary Education and Reading Department.